While many of you were busy in the malls this past weekend or trying to find the best price on that new digital camera yesterday on Cyber Monday, the dedicated team of designers and programmers here at TMC worked day and night and night and day to bring you a new look and feel. Over the past years, many of you have told me that you love to come to TMCnet on a daily basis and the hundreds of stories and blog entries we write on a daily basis contain everything you need to navigate the telecom and tech worlds. At the same time, many of you have told us the interface TMCnet has looks busy. Others have told me it is not clear that 50-100 writers contribute to TMCnet on a daily/weekly basis. 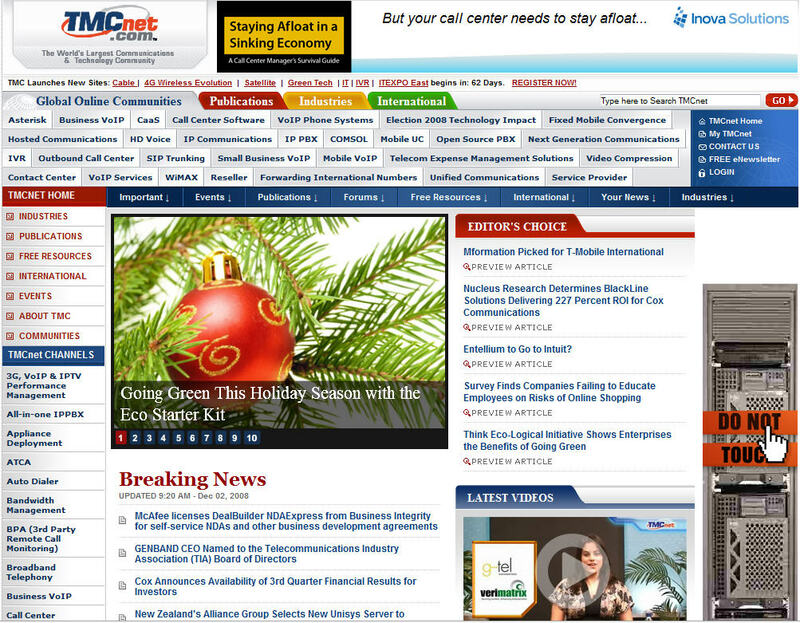 Our new redesign is meant to adress all of these great requests and we hope you enjoy the new TMCnet. One last point... Thanks to the 2-3 million communications and technology decision makers who visit TMCnet monthly and thanks to the TMC team for doing such a great job on this redesign. Nokia predicts the recession and a lack of credit will reduce cell phone sales. Nokia Siemens too says there will be a slowdown next year. The company further thinks the fourth quarter will see industry volumes fall by 20 million. Here are a few news stories I came across today to keep you up to date on show happenings so far. I didn't get a chance to read them all by the way but I wanted to share as soon as I could. There is big news out of ITEXPO this week in Los Angeles. 8x8 and Microsoft just released the news that the two companies will be working together to offer Packet8 VoIP SIP trunking service with the Microsoft Response Point Business Phone System. At a press conference held by Bryan Martin CEO of 8x8 and XD Huang General Manager of Microsoft, the two companies addressed a large crowd of analysts and press regarding the huge opportunity the two will take advantage of. In order to maximize the relationship, the both will jointly market the combined solution through their respective VAR channels. In addition, they will jointly market this solution online and via other marketing channels. For 8x8, this agreement further cements its position as an SMB IP communications provider who seems to be operating on all cylinders. The company was smart to focus on the SMB market years back when it became clear the consumer VoIP market was hard to make money in.